Nicole graduated with honors from Bishop O'Dowd High School in Oakland, California. It's not always clear how she did so well considering how much fun she had "hanging out" with friends, most especially her cousin Melvina, and besties Tina, Ann and Alison. Partying not withstanding, she was accepted into several colleges and ultimately chose to attend University of California at Berkeley. While at Cal, Nicole was accepted into the Haas School of Business where she graduated with honors while working a full-time job at The Daily Californian newspaper, first as Classified Ad Clerk through to her promotion to Classified Ad Department Manager. She has a Bachelor of Science degree in Business Administration with a specialization in Accounting and Finance. Nicole received job offers from a majority of the Big 6 Accounting firms (at the time) and she ultimately accepted a position with Price Waterhouse primarily because of their extensive roster of entertainment clients. While at Price Waterhouse, Nicole passed all parts of the CPA examination and completed all of the requisite audit hours in the state of California. Throughout her career, Nicole has had extensive training in a wide variety of business areas and topics, most especially leadership training. Nicole spent several years working for Price Waterhouse and PricewaterhouseCoopers where she planned, supervised and performed all aspects of audit and attest, consulting and business advisory engagements as well as special projects for Fortune 500 companies, medium-sized, multi-national public and private companies in a variety of industries including film, music, television, cable and radio broadcasting, high technology, retail, manufacturing and telecommunications. ﻿﻿Nicole had many business achievements while at PW (see detailed Corporate Profile attached) and she also has some little known fun facts. Nicole was selected by the San Francisco office Managing Partner, James Coriston, to model in the photo at left for an official Price Waterhouse brochure. In the year Nicole transferred from PW's San Francisco office to Century City, California, she had a dream come true attending the Academy Awards. Pause video at 2:36 and see if you can find Nicole (hint: look behind Jack Nicholson). She is thankful to one of her many mentors PwC Partner, Lisa Pierozzi, for giving her the opportunity to be a seat filler at the show. 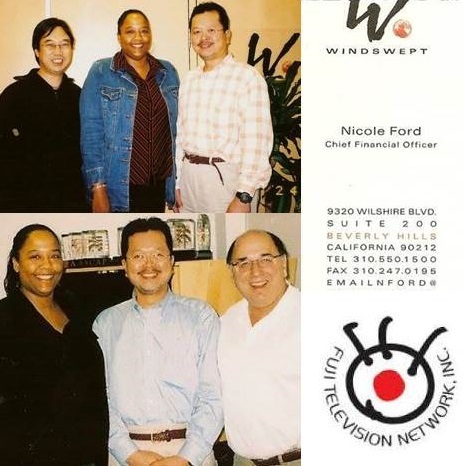 After her promotion to Audit Manager, Nicole simultaneously oversaw the three year audit of Windswept Pacific Entertainment in preparation of the company's potential asset sale, while also working with Sony Pictures Entertainment on the accounting for their acquisition of Telemundo, Universal's merger with Polygram and the annual audit of Westwood One. After weighing several job offers, Nicole finally decided to accept a position in Universal Pictures' Finance Division which was then headed by Frederick Huntsberry who succeeded William Sutman as Executive Vice President and CFO of the group. Universal's parent company was Seagram. In her role as Director of Planning & Ultimates, Nicole was not in her office sippin' on Gin and Juice (lol) as she enjoys good clean fun. She was directly responsible for preparing film pre-release reports for executive management, “what-if” analyses, "risks and opportunities" analyses, and film profitability forecasts (ultimates). She participated in various special projects including the post-acquisition integration of Polygram Filmed Entertainment’s film slate and financial forecasts into Universal Pictures’ financial forecast and reporting system. In support of that endeavor, she traveled to London with then-SVP, Dan Martinez and Frederick Huntsberry to meet with Polygram staff regarding the integration. Nicole will never forget the long days and nights in her office on the studio lot responding to that often repeated phrase: "Edgar (Bronfman Jr.) needs to know what the EBITDA impact will be before he makes a decision." While Nicole worked very hard at Universal, she also got to have some fun. She was blessed to attend several movie premieres and pre-release screenings; Erin Brockovich, For Love of the Game and The Best Man, to name a few. In addition, immediately prior to release, her group would head up to Universal CityWalk and watch a free screening of the company's latest film and on the way back occasionally go to the front of the line and hop on a ride at Universal Studios. Only occasionally! ​After a short time at Universal, Nicole was contacted by former client, Evan Medow, CEO of Windswept Pacific Entertainment when their then-current CFO, John Rudolph, announced he was leaving to form his own company subsequent to the sale of a portion of Windswept to EMI. A new successor company was formed post-sale, Windswept Holdings LLC, and as a result of Evan's phone call, Nicole spent several years serving as the company's Senior Vice President and Chief Financial Officer in Beverly Hills, California. She could not have done so well without the support of her staff, most especially, Shirley Ashe and Steffanie Wieker, as well as her very good friend Ray Gibson. She learned a tremendous amount from the Company's brilliant attorney, Moshe Kupietzky at Sidley Austin and in times of stress, she also had plenty of laughs as well as phenomenal support from Windswept London's Financial Controller, Paul Flynn. During her tenure, Windswept consistently ranked as a top 10 Billboard music publisher, and was on the charts with blockbuster artists and music icons such as Gwen Stefani, Destiny's Child, Beyonce, Craig David, Keith Urban, Brandy, Corinne Bailey Rae, Eminem, Vince Gill, Joss Stone, Michael W. Smith, Snow Patrol, Gretchen Wilson, Outkast, Rascal Flatts, Eve, Montgomery Gentry, Britney Spears, Kings of Leon, Mary J. Blige, Fergie, Usher, Enrique Iglesias, Il Divo, Ginuwine, Josh Groban and many others. The company was also bolstered by an eight figure acquisition of the Trio/Quartet catalog from Jerry Leiber and Mike Stoller. Nicole had very heavy financial responsibilities reporting to Japanese parent companies, Fuji Television Network, Itochu Corporation and Fujipacific Music as well as overseeing the finances of Hitco Music Publishing, a joint venture partnership with Antonio "LA" Reid. As she continued her rise in corporate America, Nicole embarked on a spiritual journey. She began attending services at Agape International Spiritual Center as well as various Centers for Spiritual Living in Las Vegas. She also met in private group meetings with extraordinary vocalist, metaphysician, and friend Dr. Mortonette Stephens, Ph.D. In her spiritual awakening and evolution, Nicole sought to make some profound changes in her life. She eventually discovered a book called "The Artist's Way" that changed her life for good. ​After being blessed to be a part of numerous projects, performances, events and drum and dance troupes, Nicole decided to take her performing career into her own hands by combining her business, music and theatrical experience together. In 2016 she and professional drummer and percussionist, Angelo L. Stokes along with Master Drummer, Papa Diarra Zumana, formed an African and world culture performance group named Triba! (pronounced "treeba") with the intention of celebrating African and other world cultures through the sharing of song, drumming, music, dance, acrobatics, and other specialty entertainment. ​Please check out Triba! 's videos/pictures and like Triba World Percussion Music Entertainment or Triba! on Facebook and explore Triba's website. In 2017, she joined forces with Atito Gohi, Master Dancer and Choreographer and Eric Bli Bi Gore, Master Drummer to become a percussionist and part of the management team of Vozolo Dance Company. For more about Vozolo Dance Company visit the Vozolo website at www.vozolo.weebly.com. In 2018 Nicole became a volunteer with Africa Love Store in Town Square as a cultural ambassador and production and operations manager for A Touch of Africa Las Vegas. She looks forward to expanding her network and venturing into new horizons as she continues the pursuits of her passions and desires of her heart and soul. As a child, Nicole studied jazz, Broadway-style tap, musical theatre, ballet, and gymnastics and performed in various local Bay Area productions. She trained most extensively with Yvonne School of Dancing, Alameda School of Dance (now Alameda Ballet Academy) and West Coast Dance Theatre. (As a side note, Nicole also did some modelling for I. Magnin & Company and H.C. Capwell Company). Nicole always has to give her mom credit for all the years she spent taking her to all of her lessons and hours and hours of rehearsals. She thanks her entire family for always showing up at her performances and whooping and hollering their support. As a young adult, Nicole discovered Rhythm Tap or Jazz Tap, at a small studio in Berkeley, California called Studio J. Even though Nicole always loved tap, there was a big difference between the Broadway-style tap she grew up with and the Rhythmic Tap she came to fall madly in love with. When Nicole looks back on it, sometimes she is not sure how she managed to graduate from Cal with honors and work as many hours as she worked in her career. Once she discovered Rhythm Tap, her second home became dance studios or dance floors throughout the Bay Area. She and her friend Babs would burn the midnight oil in the studio soaking up as much as possible from their mentor Mark Mendonca. Nicole spent several years attending tap camps, festivals, workshops, and master classes studying with as many teachers, hoofers and legends as her schedule would allow: Eddie Brown, Buster Brown, Sam Weber, Gregory Hines, Ted Levy, Jimmy Slyde, Brenda Buffalino, Dianne Walker, Chance Taylor, Steve Zee, Fred Strickler, Ayodele Casel, Max Pollack, Bunny Briggs, Harold Nicholas of the Nicholas Brothers and many more! If her discovery of Jazz Tap wasn't enough, Nicole took a trip to New York with some friends to see several Broadway shows and celebrate New Year's Eve in Time Square. They took her to see Bring in Da Noise, Bring in Da Funk, at the Public Theater, and it was a WRAP. Over the next several years, Nicole would find any opportunity to jump on a plane to New York so she could see the show. Nicole actually doesn't like New York, but every chance she got, even business trips to Florida, Philadelphia, Chicago, Ohio....it did not matter...Nicole would make a stop in New York to see her favorite show. Nicole estimates that she saw that show in New York over 20 times, not to mention seeing it on tour in Los Angeles and in Washington D.C. As a fanatic, of course Nicole made sure she took classes with as many cast members as she could find becoming a regular at places such as Broadway Dance Center and Steps on Broadway. She was lucky to be able to take classes with some of funk's finest tappers: Savion Glover, Omar Edwards, Dule Hill, Baakari Wilder, Dormeshia Sumbry-Edwards, Derek Grant, and Jason Samuels-Smith to name a few. Since moving to Las Vegas, Nicole's percussion expression has migrated from her feet to her hands. She has not tap danced nearly as much as she would like; however she keeps her tap shoes in the trunk and is ready to rekindle that flame anytime. In the meantime, she has enjoyed classes in Afro-Cuban dance, Salsa, African Dance, hip hop, body music, and stepping. Nicole studied violin and piano throughout her childhood. She played 2nd violin in her elementary school orchestra as well as the orchestra at Bishop O'Dowd High School. In addition to playing at a variety of events and recitals, Nicole had the pleasure of performing annually with her school orchestra at Souverain Winery in Napa Valley, California. The orchestra also performed at Sea World and Magic Mountain in Southern California. Nicole ultimately progressed to become first chair of the 2nd violin section and she was selected to be part of the band in Bishop O'Dowd's production of The Wiz. She and first violinist virtuosa extraordinaire, Alison Bailey, were forever up to straight shenanigans post-rehearsal but always held it down at showtime. As an adult, Nicole has played 2nd violin with various groups including the CSN Orchestra, Desert Springs Arts Chamber Orchestra, Bloomingdale House Chamber Ensemble, More Cowbell Ensemble, Dendera Ensemble, and the Montaggio Chamber Ensemble. She has been a solo violinist for Farasha Desert Siren and Kumuda Tribal at Baobab Stage presents: Tribal Night as well as the Las Vegas Bellydance Intensive's A Night in the City of Riches Pro Show. Nicole LOVES to sing even though she does not have extensive formal training in singing. At the age of 2, she would belt out the Star Spangled Banner, which she learned attending sporting events with her parents. Throughout her dance/musical performances and recitals as a youth, Nicole sang in a variety of productions. Nicole joined Bishop O'Dowd's Gospel Choir during High School and sang as an Alto and Tenor at various performances and church services. As Nicole started on her adult musical journey, she finally decided to stop just singing in the shower and in her car. In 2008, she joined the Spirit of Joy Choir at the Center for Spiritual Living Greater Las Vegas. Life then spiraled into Nicole being invited to sing with several groups such as Vocal Intervention, LNJ Trio, New Song Chorus, Gospel Music Workshop of America, Facebook Chorale, etc. Nicole's percussion gifts are generally spotted first due to the rarity of a female playing at her level and her singing talents are oftten discovered when it's time for the percussionists to sing a call and response tune. As a result, Nicole has also sung with most of the drum and dance groups for which she has played. Nicole is very comfortable and adept at singing beautiful harmonies in choirs, ensembles and on background vocals.